It’s been a while since I have had this kind of news. My last book, the young adult title PRIDE MUST BE A PLACE, came out in February of 2018. Now, I’m excited to announce that I have accepted a contract with the same publisher to publish my 7th novel, the adult contemporary title I WILL TELL THE NIGHT. In September of 2016, I discovered that I had won the Muskoka Novel Marathon’s Best Adult Novel Award for the 5th time for I WILL TELL THE NIGHT (<-read about that in this post right here). The true story behind the writing of this novel is that it almost did NOT get written. The plaque on the coveted BEST NOVEL AWARD trophy for 2016. 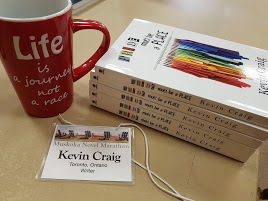 The novel marathon takes place over the course of 72hrs, every July, in Huntsville, Ontario. The literary event that is also a huge fund-raiser to help the YMCA of Muskoka and Simcoe County with the funding of their literacy programs is a must-attend event for me. I love the adrenaline rush it gives me to attempt to write an entire novel in the space of one long weekend. Especially when it involves being in a room with 39 other writers typing away at their own attempt to pull off the exact same feat. It’s a magical time every year. In Which Way Shall I Procrastinate TODAY? Or, Finish the Damn Book! I’m doing it again. I have a fantastic opportunity in front of me and I have one job to do prior to taking advantage of this opportunity, and I am doing everything in my power to avoid the job. Wayson. Ontario Writers Conference. 2016. On September 23rd I discovered that my 2016 Muskoka Novel Marathon novel I WILL TELL THE NIGHT took the Best Adult Novel Award at the Marathon Wrap Up Party. With the honour came a Muskoka chair (Adirondack chair, for my American friends), and an envelope filled with beautiful gushing feedback from the bevy of judges who read the manuscripts and chose mine as the winner. From that date (Sept 23rd), I had six weeks in order to get the manuscript completed and edited into shape before submitting it to the MNM organization for agent feedback. Then came a week in which ALL THE THINGS happened…all the things, that is, except the writing of the manuscript I WILL TELL THE NIGHT. You see, I was just too busy to write words. I was hanging with friends at their cottage, I was hanging with the old gang from the Ontario Writers’ Conference–including an entertaining drive from Toronto to Whitby and back with the incomparable Wayson Choy, in which we lambasted Trump as we listened to the candidates’ debate on the CBC, I was schmoozing with the contributors of the upcoming horror anthology Purgatorium, and then I was interviewing said contributors for this blog, and I was visiting my kids and grandkids, and we just HAD to go to the opening weekend of Miss Peregrine! There were a few other things in there, I’m certain. The week flew by and brought me to FIVE WEEKS remaining of the countdown to submission. I now find myself smack dab in the middle of this week and I’m not really motoring through the writing as I should be. This is WEEK 2! I’m proud to have found yet another distraction! My latest obsession/distraction – HOLDING UP THE UNIVERSE by Jennifer Niven, the lovely writer who also brought us ALL THE BRIGHT PLACES. This book will be, perhaps, the death of me. Both Libby and Jack are fascinating characters and I am absolutely devouring their story. I never imagined loving a book as much as I loved ALL THE BRIGHT PLACES. Only Jennifer Niven could make me love something more than ATBP! And if this book doesn’t distract me enough to cause me to squander this opportunity, I’m almost certain something else will come up. If you need me, I’m just going to be over here attempting to write slightly more than half a book in 4 1/2 weeks, while simultaneously editing said book. It’s a difficult task, but it is also one I should not be taking so lightly. Must. Finish. Writing. The. Damn. Book! I Will Tell the Night – Muskoka Novel Marathon 2016 Best Adult Novel Award! A writer is sometimes lost and sometimes found. And quite often it’s a monumental moment that causes the shift between those two delicately interconnected worlds to occur. This weekend, I had one of those moments. I am found. The Dock at Dale & Sue Long’s Haliburton cottage on Lake Kashagawigamog this past Saturday morning, prior to our Hunter’s Bay Radio stop along the way to the annual Muskoka Novel Marathon Wrap-Up Party! I swear, sometimes it seems a writer’s life is made up of a series of gifts, miracles, and happenstances. Or so it very much seems to me. 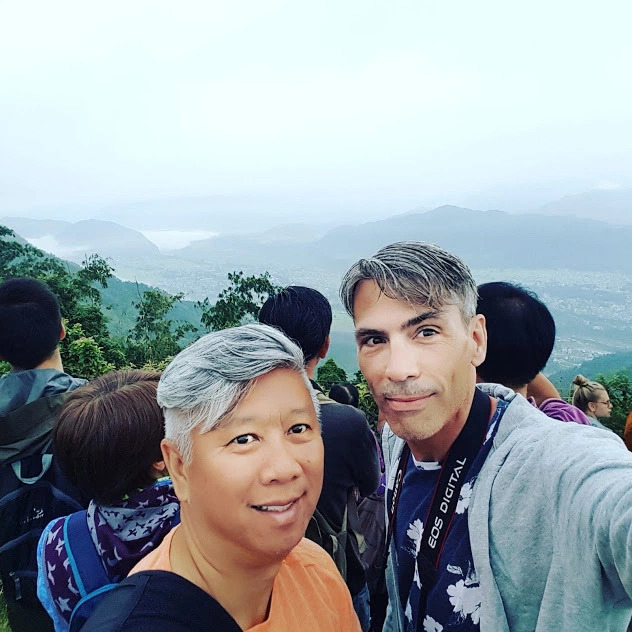 Every time I bring myself close to the edge of oblivion–to that place of writer/notwriter that I believe most writers go to–something or someone in my life brings me back to the heart. Writers! From left to right, Tobin Elliott, Christine Cowley, myself, and, Dale Long. Tobin and Dale were interviewed together for an episode of the show appearing later in October. And Tobin helped out with the narration of my play THE SPEECH, which I performed with Christine. This past weekend, I began one of my many cycles of intense writerly related periods. They seem to come and go. Nothing happens for weeks or months at a time to even remotely suggest that you may in fact be living the life of a writer, and then suddenly you find yourself in a chaotic hotbed of WRITERLY stuff. What started as a thrilling adventure at the local radio station in Huntsville, Ontario, this weekend, culminated in discovering that I had won a much coveted writing prize. Again. I was invited by writer friend Christine Cowley to be interviewed on her radio program STORYLINES on Huntsville’s Hunter’s Bay Radio. But not only was I interviewed, which was a thrill in and of itself, but I also performed one of my Trafalgar 24 plays for the radio program…along with Christine herself playing the role of the lead in the short play, and my other writer friend Tobin Elliott stepping in as narrator. It was such a fun time! The episode of Storylines airs in early October and I can’t wait to see how the performance went. It will be interesting to see if it translates well as a radio play. We stayed in Haliburton over the weekend, taking up residence in the cottage and bunky of writer friend Dale Long and his wife Sue. It was a thoroughly enjoyable stay, filled with great laughs, amazing food and good friends. Dale is something of a BBQ aficionado and what he can do with a grill, a cedar plank and a side of salmon is almost religious. We thoroughly enjoyed our time with the Longs, the Elliotts, and the beauty of Haliburton. After our stint as radio celebrities in the recording studios of Hunter’s Bay Radio Station, Dale, Tobin and I went to Kelsey’s in Huntsville with our significant others (Sue, Karen, and Michael) for a quick lunch prior to heading to the Muskoka Novel Marathon Wrap-Up Party. We were all excited to see who would take home the peer nominated awards and the Best Novel Awards this year. After the long summer that follows the July marathon, it’s always a special treat to head back to Huntsville and reunite with the other marathon writers…so the excitement we had felt at the radio station was only growing as the wrap up party approached. The photo above-left shows the table full of awards handed out every year at the novel marathon wrap up party, from peer nominated awards to the judged Best Novel awards. On the right, Kate and Nancy from the YMCA revealed the total raised at this year’s Muskoka Novel Marathon—A whopping $36,000.00. Just see what 40 writers can do when they put their hearts to something. ALL FUNDS raised go directly to the literacy programs of YMCA Simcoe/Muskoka Counties. The Winners Take a Selfie! I was extremely thrilled to have been awarded the BEST ADULT NOVEL AWARD for the 2016 Muskoka Novel Marathon for my novel I WILL TELL THE NIGHT. And just as thrilled for the lovely Lori Manson, who took home the coveted BEST YOUNG ADULT NOVEL AWARD for her novel NED AND NORA STONE. I did not think I would ever win the Best Novel Award again. I counted my 4 previous wins among my greatest feats in my writing life. With the amount of struggling I have done in recent years, I can’t even begin to describe how much I needed this. It is the vote of confidence I needed to continue writing. It’s pure unadulterated validation. I would like to thank Dale Long for two things. The first…over 24hrs into the marathon, I still did not have my novel started. I couldn’t connect. Dale told me to tell my story—just shake it up and make it fiction. Or something along those lines. So I said, “What have I got to lose…might as well do something!” He stirred my creativity and got me started. The second thing he did? I wrote my two title considerations down on a piece of paper, looked about the room until I saw Dale (who happened to win this year’s SPIRIT AWARD–for the 2nd year running) sitting and typing…then I approached him and asked him which he preferred. So, it is because of his choice that my novel is called I WILL TELL THE NIGHT. THANKS, DALE! Here it is! My name on the Best Novel Award trophy again! VALIDATION! What an incredible weekend. Filled with affirmations, friends, laughter, food, love, light and life. I want to thank Tobin’s wife, Karen, for starting the snowball-rolling-down-a-hill conversation that culminated in the arrival of my new nickname, which I will expect to be addressed by from this day forth. I am LORD AWA (awa aka AWARD WINNING AUTHOR). Stay tuned to this spot! My spate of WRITERLY related chaos is still ongoing this time around. Tonight and tomorrow night I have some exciting writerly events happening that I’m sure I will want to write about. Stay tuned! The Reasons Now Available at Amazon for Kindle! The Reasons is now available as a Kindle book at all Amazon locations. If you have already read this book, please consider reviewing it at Amazon. If not, you can now pick it up with 1-Click for your Kindle or Kindle App. When Maggie flippantly hands her mother’s house over to Tobias, he sees an opportunity to learn how and why his family became so shattered. Be careful what you wish for. When his world begins to collapse from the weight of un-buried secrets, he focuses on a stranger from his parents’ past. Only by eliminating the past, he believes, can he make his family whole again. The Reasons won the Muskoka Novel Marathon’s 2008 BEST ADULT NOVEL AWARD. Note: This title is NOT young adult. Get it now with 1-Click! Sebastian’s Poet Now Available at AMAZON for KINDLE! As of today, SEBASTIAN’S POET is NOW available on Amazon for Kindle! If you have already read Sebastian’s Poet, and would like to share a review on Amazon, that would be wonderful. Otherwise, you can purchase it now for Kindle. Get it now with 1-Click on Amazon!